When I first started researching for this post, I felt completely out of my league. I had no idea what the word ‘vestibular’ meant, let alone what constituted age-appropriate vestibular system exercises for kids, but the more I read, the more fascinated I became. Often referred to as the ‘sixth sense’, our vestibular system is located in our inner ears and is responsible for our spatial awareness. It allows us to coordinate balance with movement and, when performing correctly, it works in conjunction with our other senses to ensure we feel safe in our environment. When our vestibular systems are in tip-top shape, all is good in the world. It gives us a sense ‘gravitational security’, and helps us maintain appropriate balance and control when we’re engaging in activities that require our feet to leave the ground (swinging, jumping, etc.). On the flip side, a person with vestibular processing challenges may avoid or seek vestibular input. They may appear clumsy, prefer sedentary activities, and have difficulty with fine motor tasks like handwriting, or they be hyperactive and impulsive due to a constant need for movement. Individuals with sensory processing disorder and developmental disabilities like autism often experience challenges with this so-called sixth sense, and if you suspect your child has problems with her vestibular processing, I urge you to contact a qualified health professional for advice and treatment options to help with her development. One of the best ways to help children develop is to find activities that feel like play instead of practice, and this collection of vestibular system exercises will allow you to do just that. Be mindful of how your child reacts to each activity and back-off if she finds them too scary or overwhelming, and make sure to speak with a professional to ensure you are choosing vestibular system exercises that are appropriate for your child’s challenges and developmental goals. 1. Balance Board: Perfect for little feet and ideal for both indoor and outdoor play, this adorable monkey balance board by ALEX Toys is a fun way to help improve your child’s balance and coordination. 2. Indoor Swinging: Hanging swings are a great way to instil a sense of calm in kids who have trouble sitting still while simultaneously helping to improve their sense of body awareness. Many children refer to these swings as ‘nests’ or ‘cocoons’, and parents rave about their ability to calm meltdowns! 3. Bike Riding: Riding a bike is one of many fabulous vestibular system exercises for kids, but if your child struggles with balance and coordination, teaching her how to ride a bike can be challenging. Talk to her OT about different strategies, and consider investing in a balance bike, which teaches kids proper balancing techniques rather than focusing on solely on pedaling. 4. Rocking Movement: If your child constantly seeks vestibular movement and you’re looking for simple sensory integration activities for kids that won’t ruin your furniture or require a trip to your local playground, consider picking up a kids rocking chair. They offer a simple way for kids to get the movement they crave in a calming manner! 5. Scooter Board Activities: Scooter boards offer a great way to develop a child’s balance and coordination, and there are TONS of fun activities you can do with them. Check out this collection of scooter board activities over on The Inspired Treehouse! 6. Jump Rope: Another simple yet effective way to help develop your child’s balance and coordination is to engage her in some good ole’ jump rope fun. Get your child even more excited with this collection of jump rope songs by Five Little Chefs as well as these light up jump ropes by Discovery Kids! 7. Egg Races: You can make this as easy or as hard as you want to. Start with a simple race across your living room, and then make the game more difficult by putting blankets and pillows on the floor. You can also have your child switch between her right and left hands to add an even bigger twist! 8. Trampoline Fun: If your backyard is big enough for an enclosed trampoline, there are HEAPS of ways the whole family can have fun together while simultaneously helping to develop your child’s vestibular system. Family Days Tried and Tested has a ton of trampoline fun ideas to get your creative juices flowing! 9. Dance Party Magic: Sometimes a simple spur-of-the-moment dance party is all it takes to get your kids moving and balancing. Crank the tunes and encourage them to do silly movements, like shaking their head from side to side, jumping up and down, and hopping on one foot. 10. Hopscotch with a Twist: There are so many ways you can turn a boring ole’ game of hopscotch into fun vestibular exercises for kids. Have your child only jump on odd or even numbers, ask her to switch from jumping with 2 legs to one leg, instruct her to jump backwards and then forwards at different intervals, and yell out random numbers to keep her guessing and engaged. 11. Twister: If your child has weak core muscles, a game of Twister offers a brilliant and fun way to engage her core while simultaneously strengthening her balance and coordination. 12. Exercise Ball Activities: If you’re looking for simple vestibular system exercises for kids you can do at home, an exercise ball is a fabulous tool as you can do so many different things with it. Ask your child to lie on her tummy on the ball and sort objects from one container to another, have her sit on the ball and then lie backwards and reach her arms above her head so she can retrieve objects off of the floor, see how many times she can crawl over the ball, ask her to give you a ‘massage’ by lying on the floor while she rolls the ball up and down your back, get her to push the ball up a flight of stairs…the possibilities really are endless! 13. Tape Activities: Yes. You read that correctly. A roll of masking tape combined with a little creativity can go a long way in helping to develop your child’s vestibular system. Check out these simple tape activities on Hands On As We Grow for some inspiration! 14. Visit Your Local Playground: From merry-go-rounds and monkey bards, to swings and slides, playgrounds have a lot to offer in the way of vestibular system exercises. Best of all? They’re free! 15. DIY Balance Toys: Contrary to popular belief, vestibular system exercises don’t need to cost an arm and a leg. While there are a ton of great products you can buy to help support your child’s development, there are a lot of parents who have walked the walk before you and they’ve come up with some pretty spectacular DIY options that are light on the wallet. Check out this DIY Balance Beam and this DIY Balance Board by And Next Comes L. Simple yet brilliant, right?! 16. Create An Obstacle Course! While all of these vestibular system exercises for kids are fun on their own, setting up several into an obstacle course is even more enjoyable for little ones! You can do this outside in the backyard, or split it up over 2 or 3 floors of your house, requiring your child to walk up and down the stairs in between sections. It doesn’t need to be anything fancy – as you’ve seen above, there are heaps of things you can do with masking tape and an exercise ball! – and the more exciting you make it for your child, the more she’ll want to participate. I hope you found this collection of vestibular system exercises for kids helpful, and that they gave you the knowledge and inspiration you need to find ways to turn practice into play both at home and in the classroom! 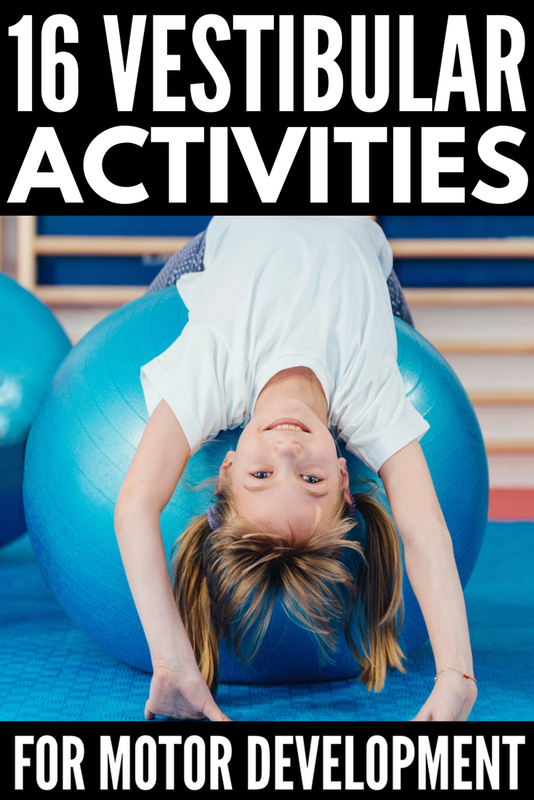 If you liked this collection of vestibular activities for kids, please share this post on Pinterest! And if you’re looking for more ways to have fun with your kids, please follow our Kids board where we share all kinds of fabulousness!